HERE THAT’S SPOILT BESIDES YOU. 8,825 feet above sea level in the Pir Panjal range of the Himalayas, stands a world-class resort that captures the beauty of its pristine setting. With majestic views of the Affarwat Peaks, The Khyber Himalayan Resort & Spa is spread over 7 acres of a sylvan coniferous forest. A world away from the ordinary, this 85-room resort is a haven of luxury, designed to pamper you in every way - with plush interiors, fine cuisine and restorative treatments at The Khyber Spa by L’Occitaine. You can also ski on some of Asia’s finest slopes in winter, trek and picnic through unspoilt forests and flower bedecked meadows in spring or tee off on the world’s highest golf course. 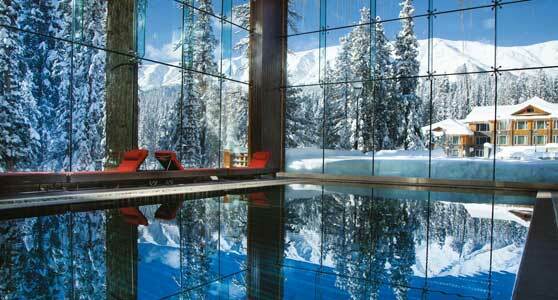 The Khyber is paradise in every season of the year. Your experience of paradise begins with a 90 minute transfer by car to The Khyber, through languid meadows and forested slopes from closest airport at Srinagar, just 65 kilometres from the resort.